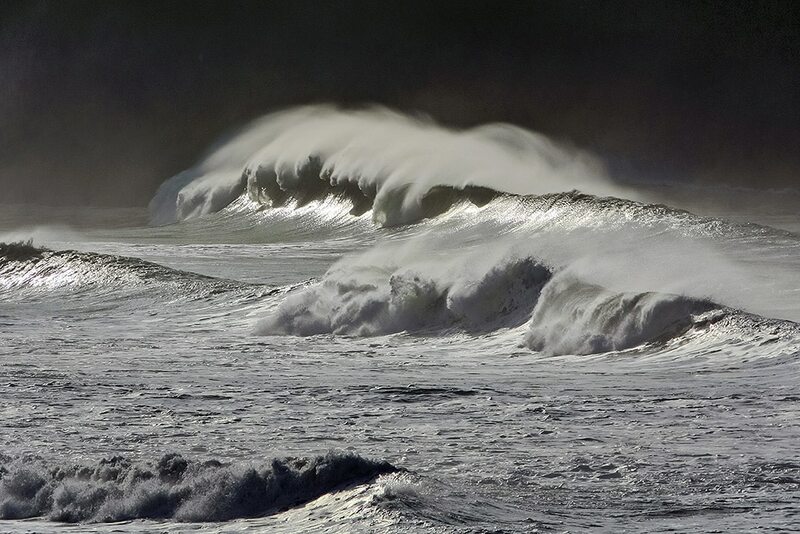 Always, always, always the sea….. I was enjoying my wine sitting high above The Reef – the jumble of granite boulders and bedrock that punctuate the eastern end of Porth Neigwl. 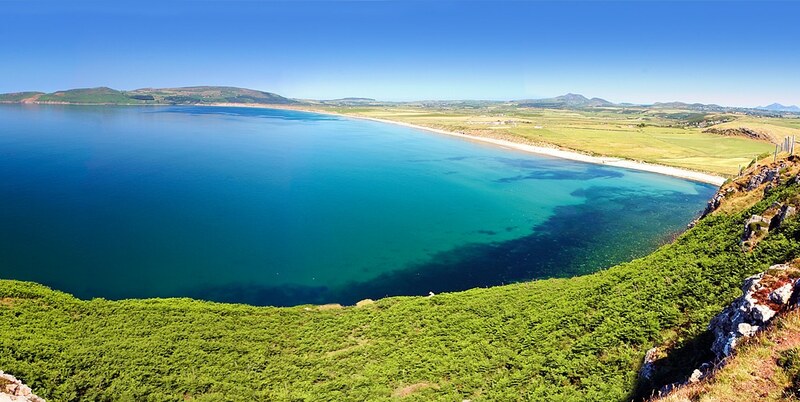 The sole natural feature of significance in this breathtaking four mile sweep of sand sitting between the headlands of Mynydd Penarfynydd and Mynydd Cilan, The Reef is a landmark that seems almost embarrassed by its existence, so close does it sit to Cilan headland when it had apparently such a long stretch of sand to choose from. The reality is that the rest of the seemingly featureless expanse of sand and shingle enjoys a wealth of idiosyncrasies beneath the cloak of the Irish Sea – of ever-shifting sandbars, deep pools, rips and currents. But, barring a shift in the wave or a swirl in the current, these are disruptions invisible to all but expert eyes until low tide reveals them for what they are – minor imperfections in an apparently smoothly arcing crescent. In stark contrast, set out in bold relief other than at the highest of tide, the Reef is always there in your eyeline – the black rocks (and heavy kelp that clings to them however powerful the surf) a stark contrast to the golden sands that stretch out endlessly towards Rhiw. One of the many charms of Abersoch is that, on top of the boundless opportunities for rest and relaxation within the village itself (or just a short walk from it), the mini-peninsula on which Abersoch sits (at the south-eastern end of the Llyn Peninsula itself) offers a host of wonderful and sometimes wilder adventures only a few short minutes away by car, bike, or on foot. 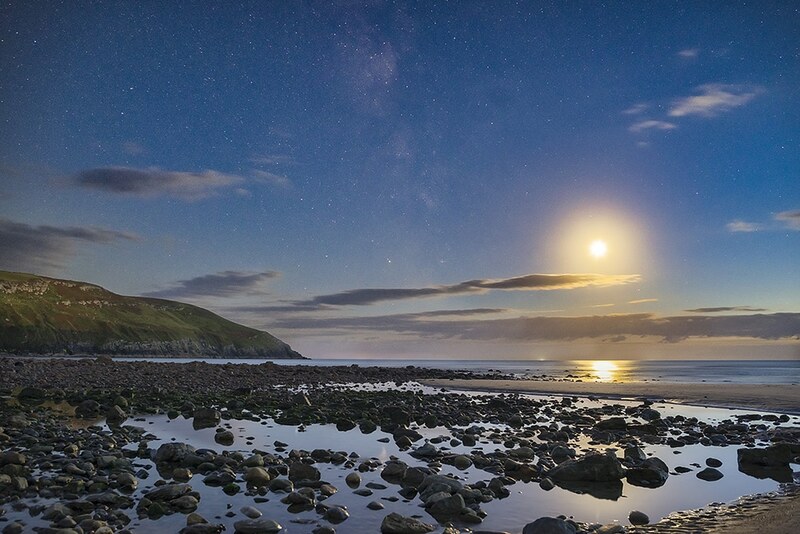 With our Somewhere Only We Know series we have taken you to some of those enchanting destinations – including Porth Ceiriad, Rhiw Mountain, Cilan Headland and, most latterly, Quarry Beach. Perhaps the biggest contrast of all, yet just a couple of minutes drive down through Llanengan is the wind and wave-blasted wonderland of Hell’s Mouth. The beach itself is so wild and so extensive that it merits a series of articles, so for today we are going to focus on one of the more magical of the selection of destinations the beach offers – the legendary Reef. 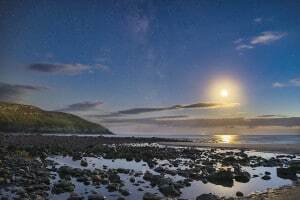 Not only does the Reef itself offer a special haven in its own right – for barbecuers, surfers, anglers, star-gazers, dolphin watchers, rockpoolers, sunseteers and campfirers (are they even words?) 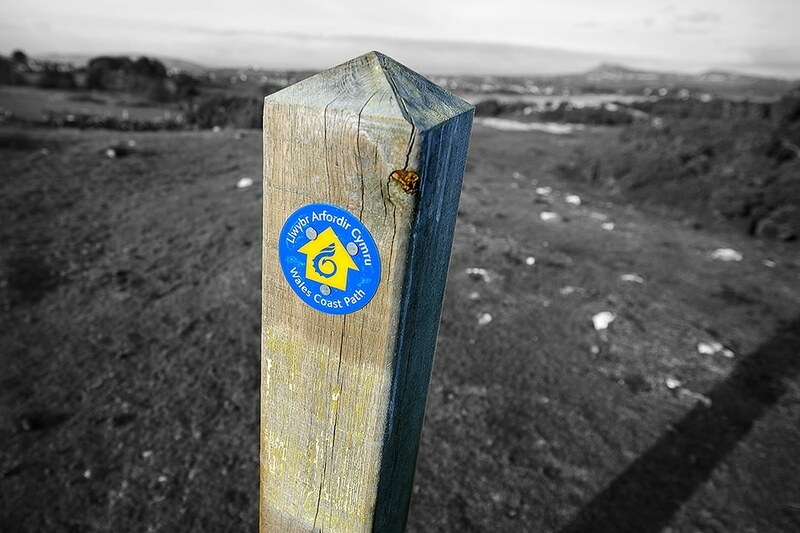 – but located as it is on the Wales Coastal Path it also sits at the heart of a number of walks – long and short, flat or hilly, to suit every taste. So there is something here for everybody. Even if our favourite pastime is simply to head there and ‘be’ – to sit and contemplate a stunningly beautiful and peaceful location, however wind or surf-whipped it may be. So lets take you there. Coming out of the village past Ysgol Abersoch turn left towards Llangengan opposite the new Harbour Mews development. And that’s it really! 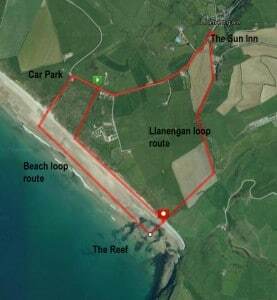 Just continue for a mile or so along the winding lane, through Llanengan, past the Sun Inn, on for a few hundred yards more and either park in the surfers car park at Hell’s Mouth or on the grassy verge on the hill down to it. The advantage of the latter is that it gives you easy access to the green kissing gate on the left just after the last of the houses on the road down to the car park. 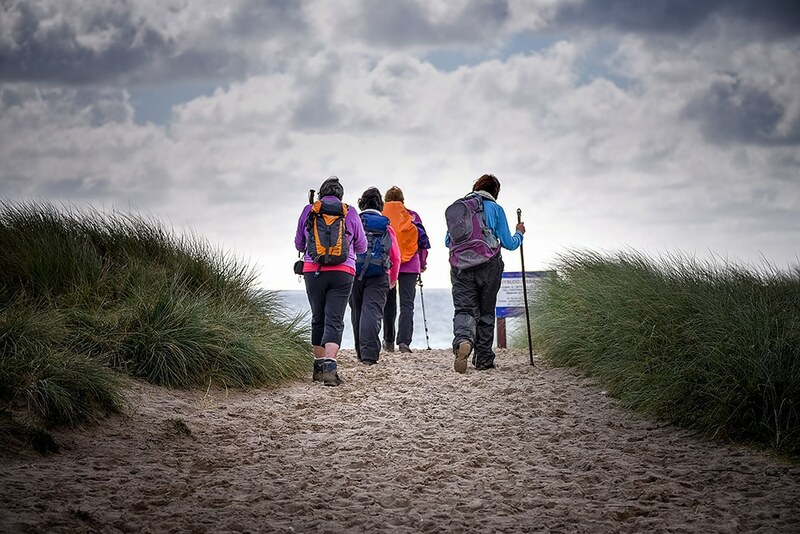 Gather your things – your barbecue, surfboard, fishing gear, picnic, camera, binoculars, or whatever takes your fancy, and head along the path across the sandy grassland to the green gate at the top of the cliffs, and you are on your way. Our preferred approach is to turn left along the path along the top of the cliffs, saving the sands for the walk back. This way you get to see the unfolding drama of the beach from the height of the cliffs as you make your way to the Reef – it’s a lovely little ‘beach loop’ of a walk that can easily be done in under an hour. For a slightly longer walk that takes in the Reef as it’s highlight, head along the cliffs as above then drop down to the Reef and the little stream that trickles across it towards the eastern end of the beach. Once you have had your fill of exploring the Reef and the base of the Cilan headland, with its heaps of driftwood piled up at the foot of the cliffs, take the path left across the fields at right angles to the beach until you hit the base of the high bluff that sits behind Llanengan village, following the path that skirts the base of the bluff until it morphs into the track that conveniently runs behind the legendary Sun Inn. The wise will take the opportunity for a refreshing drink (it would be rude not to wouldn’t it?) or a meal from the increasing ambitious menu that offers some fabulous seafood options, before turning left to wander back along the the lane to your starting point. The ‘Llanengan Loop’ is one of those walks that offers such variety, different perspectives and opportunity that you feel as though you have covered a great deal more distance than you actually have. But who is to know? You feel good and feel fulfilled – and quite possibly feel full of a tasty meal and a couple of drinks – so all is right with the world! But in any event you won’t be home in a hurry unless you really want to and that’s not something we recommend. Between times you must linger awhile at the magical spot that is the Reef. 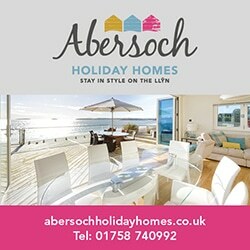 Check your tide tables either in the village or online at AbersochLife.com and try and arrive closer to low tide than high. That way the rocky vista of the Reef will be laid out before you. If you can catch it on an evening sunset you will gain the added bonus of the rock pools reflecting the pinks and purples of the setting sun, the emerald greens of the kelp stranded on the rocks by the low water and the myriad patterns of the waves breaking on the rocky foreshore. Those clean ‘lines’ of swell that have crossed the Atlantic to break as smooth surf along most of the beach are confused here at the end of their thousands mile journey by the jumble of rocks that is the Reef, creating private swells and mini-breaks as they wrap around first a small boulder and then a hunk of bedrock to create an ever-changing liquid scene. The same rocks create a stunning scene for the keen snorkeller, paddle-boarder or kayaker. 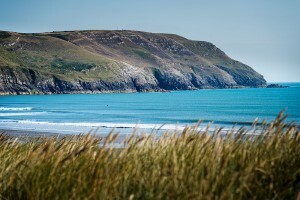 Choose one of those hot, limpid, wave-less days that Porth Neigwl serves up more often that might be expected through the summer months and paddle your way along the beach around high tide. Provided the sea has been calm for a few days and the water is resultantly clear, the scene from above the Reef is remarkable – like a giant marine aquarium. You can gain a sense of the clarity of the water on days like this from Martin Turtles beautiful photo at the top of this article. Those same strands of kelp that lay limply over the rocks at high tide now sway and dance to the tune of the underlying swell that never leaves this constantly moving body of water. Between the weeds swim fish of all sizes, crabs and starfish visible on the sea-bed. In some ways it is the rocks of the Reef itself that offer the true visual treat through – those giant stones that had looked black and grey when marooned amongst the sands at low tide now reveal every hue of silvery grey, coppery browns, golden sparkles and the jettest of jet black from your vantage point above them as you paddle your way across the Reef. I recommend late afternoon or early evening so as you paddle back to your access point you see the first hints of the stunning light show that is that setting sun heading for Rhiw Mountain or Bardsey Island, depending on how late in the summer you have made your visit. When a bigger swell is running it is to the Reef that the peninsula’s best surfers will head and, whether a surf enthusiast or not, so should you if you want to see scenes that you maybe thought were the exclusive privilege of the Hawaiians or West Coast Americans. 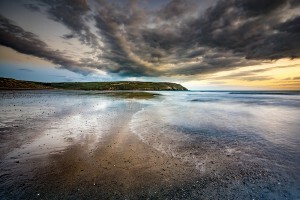 Elsewhere in this issue we feature the Abersoch adventures and stunning photography of Eilir from West Coast Surf. If you get lucky, usually at the beginning or end of the day (before or after work in the surf shop) you will witness Eilir and the rest of the local crew taking on the bigger and better waves that the Reef delivers. The rocks create the extra resistance the swell needs to ramp up bigger, stronger and cleaner waves than along the rest of Hell’s Mouth, which is otherwise almost exclusively a more modest ‘beach break’. To sit on the cliffs above the Reef and watch this crew pull off their moves with the leisurely grace and beauty that only a lifetime of practice can bring is a genuine privilege. But be warned – this is not a place for any other than the expert surfers – the bigger waves, the rips and the rocks lurking below the surface make it a venue that all but the best should avoid – other than as a lucky witness to a priceless (yet free!) combination of great talent and stunning location. I speak from painful experience. The crew riding the wild waves of the Reef rather beautifully capture the primal experience that this place, so close to the village and yet so different in environment, offers. It is a destination where, particularly when the winds are blowing and a swell is running, you feel as close to our roots as may be possible in our increasingly tamed society. In some ways, with the right gear on, the colder seasons bring the closest connection of all. As the winter gales howl, whipping your hood around your face, sea-spray misting across the clifftops like the most potent of rain squalls and the massive Atlantic swell pounds the rocks before you, there is no better place to be – out there feeling that connection – until the call of a log fire and a glass of red brings you back to civilisation. I recall a balmy, windless summer evening a couple of years ago when The Reef presented me, and a few other other lucky witnesses, with just that sort of primeval call – a rare chance to see the marine food chain in dramatic, elemental action. I was wandering over to the cliffs from that green kissing gate just up the hill from the surfers car park and met Abersoch Watersports top man and general Hell’s Mouth guru Phill Woods making his way back across the dunes. “Any fish showing?” I asked. “Everything!” he replied with a smile. And so it was – raw Darwinian action the full width of the bay. The first clue was the silvery shimmer of the sands where the tiny summer waves lapped onto the shore. That and the hundreds of gulls wheeling, cawing and pecking at the beach in a feeding frenzy. I clambered down the cliffs, fishing gear in hand. All along the beach as I made my way to the Reef (where I sensed the real drama would be) were tens of thousands, millions, of whitebait driven onto the shore by vast shoals of marauding mackerel – that silvery shimmer I had seen from my clifftop vantage point was layer upon layer of marooned bait-fish. It was mid-tide at the Reef meaning that to the left of the reef a separate mini bay was formed as it always does with a decent sized tide, delineated by the Cilan headland at its easterly margin and by the raised rocks of the Reef itself to the west. This mini-bay was alive – pulsing and swirling with the pecking order of the marine kingdom in all its elemental glory. In the margins were millions, literally millions, of whitebait so thick that you could barely see two inches into the crystal clear waters. To my right a fellow angler was simply dipping his landing net into the sea and pulling out a bursting net-full of handle-creaking whitebait. Just a few yards out thousands of mackerel were going berserk – crashing and smashing into the shoals of whitebait, leaping clear of the water in their feeding frenzy. Beyond the mackerel spiny dorsal fins could be seen cutting the surface of the summer seas – great shoals of big bass that had followed the mackerel that had followed the whitebait and were gorging on the similarly trapped shoals of mackerel fattened by their voracious diet of whitebait. And there, swirling sleekly on the outskirts of this almost biblical scene, were the pack of seals that had followed the bass that had followed the mackerel that had followed the whitebait, slipping below the surface to drive into the shoals of bass and emerge seconds later with a bar of silver in their teeth as they fed themselves up for days to come. I would love to be able to say that out beyond the seals were a pod of dolphins to complete the picture. It was not to be, despite warm summer evenings being the best time to witness the dolphins cruising and porpoising their way across the wide expanse of Porth Neigwl. I like to believe that they were in fact there – operating beneath the surface to square the circle of this stunning scene. I watched for a couple of hours – it was enough to simply witness without the need to take part – but the sportsman in me eventually got the better as I unshipped my fishing rod to take bass or mackerel every cast for an hour. I donated a few of the mackerel to a family barbecuing in the dunes behind the Reef. Their children thought I was some sort of wonder angler as I caught them one each to order – if only they knew! The rest of the catch were slipped back to re-join their own dining party until with the dropping tide the scene disappeared as quickly as it had arrived, the gulls gorging on the whitebait driven up onto the sands the last evidence of a remarkable scene courtesy of Hell’s Mouth’s remarkable Reef. The nature of the feature that is the Reef on this long, long stretch of a bay is that it is inevitably where the action is. The same rocks that generate the surfers waves similarly offer the cover and food for fish of many species – the cod in winter and the wrasse, bass and mackerel in summer. And the way that little bay is created to the left of the Reef makes it a natural magnet for vast quantities of sea-borne treasure, especially when the winter storms are blowing. Into the bay is washed an endless trail of driftwood of all shapes, sizes and provenance – a rustic furniture makers heaven delivered by Neptune himself. Flotsam and jetsam of all kinds – from the depressingly large quantities of plastic that we all need to work harder to minimise to the frankly bizarre. A child’s doll that has crossed the Atlantic and lies marooned on the grey granite rocks, and endless odd shoes of every style – yet never a pair! The result is that you will rarely go short of wood for a campfire on the beach here – sitting in the shelter of the dunes by a warming fire alongside the babbling little stream and watching the flooding tide pushing the waves across the rocks of the Reef is a rare private, near-wilderness pleasure, just minutes and yet worlds away from the busy village. It’s highly recommended. The fishing and the surfing and the birdwatching may be great but there’s really no need to do anything – just sit and contemplate and reflect on how fortunate we are are to have such beauty and wonder all around us. So, next time you feel the need to blow away the cobwebs, maybe to spirit away the consequences of a longer night than was strictly advisable in the village bars, or simply to feel that ‘connection’ that long days spent in a stuffy office have pushed too far from your soul, take a wander down through Llanengan and make your way to one of our special locations. Take a seat in the dunes at the foot of the cliffs and feel the magic of the Reef. You won’t be disappointed. Under the brine you won’t notice the dark….